The Centre County Office of Planning and Community Development is proud to announce the completion of the Centre County Recreation and Greenway Plan. This Plan was funded in part by a grant from the PA Department of Conservation and Natural Resources (DCNR) and matching funding from the Centre County Board of Commissioners. 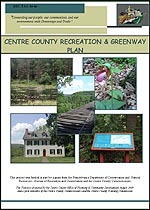 It was completed by the staff of the Centre County Planning and Community Development Office with the assistance of a Greenway Steering Committee, municipal officials, and representatives from schools districts, public agencies, conservation groups, and individuals/agencies from adjoining counties.